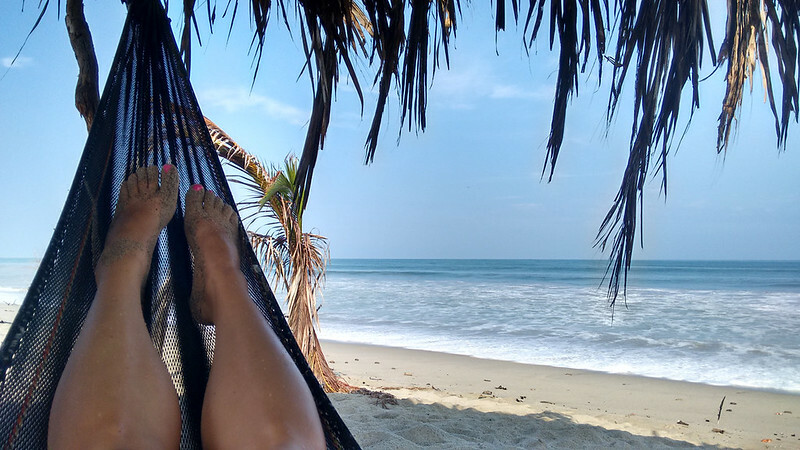 It’s been over six months, but I still dream about reading, writing, and relaxing in the hammocks on the beach in Zorritos, one of the towns that dots the coast in Tumbes in northern Peru. For me, these few days spent staying in my own private bungalow and waking up to the sound of the waves crashing on the beach were priceless, restorative, and life-affirming. When I started researching my trip to northern Peru earlier this year, I knew I wasn’t in the mood for the constant party atmosphere in Máncora, but as a solo traveler I didn’t want to feel completely isolated. I stumbled across an article mentioning an eco-hostel within steps of the beach in Zorritos, and I knew it was the place for me. I was right. The best part of my private bungalow? It had its own balcony with HAMMOCK INCLUDED! Talk about heaven. 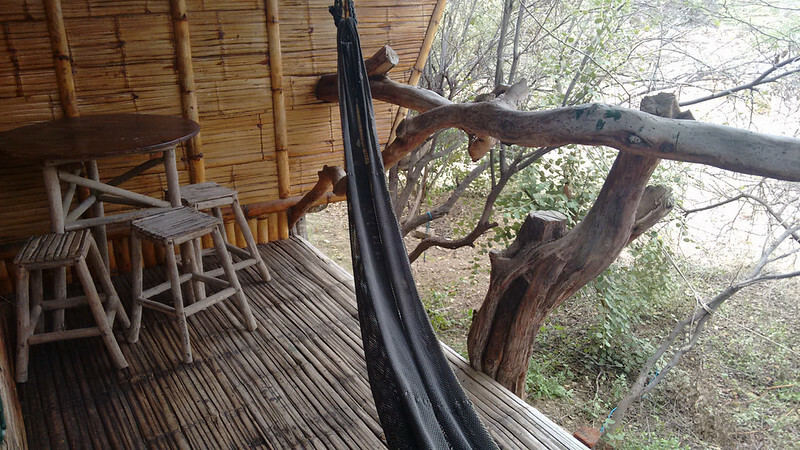 I spent hours each morning and evening swinging on the hammock, reading my book on meditation (I had just finished a 10-day meditation retreat, after all), and contemplating how to go with the flow as my job in Chile came to an end. Not to mention the time spent right next to the ocean, swinging in the beachfront hammocks. There’s a reason people often stay here for weeks at a time; if I hadn’t had to head back to Chile for work, I would have extended my stay too! 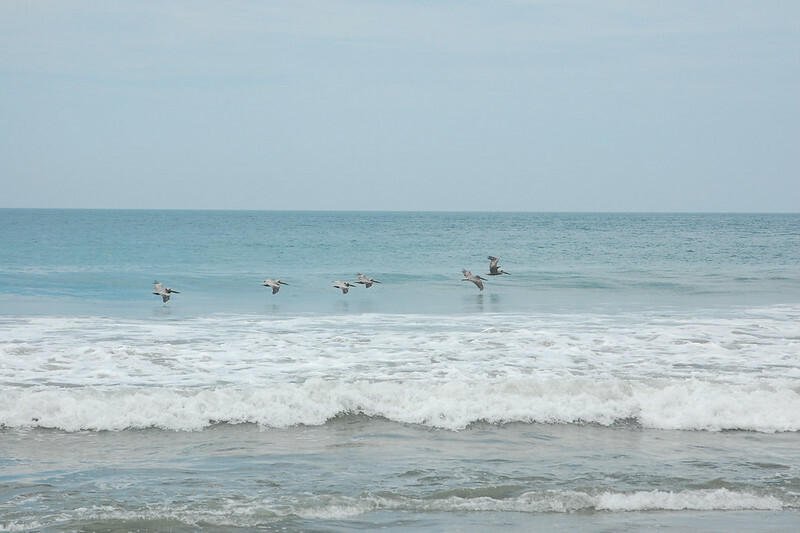 Although I still think Punta Sal has the most beautiful coastline and pristine beaches of anywhere I’ve been in Peru, Zorritos was pretty special too. El Niño was acting up, so it was cloudy for much of my stay, but on one glorious morning, I saw the gorgeous blue skies and turquoise waters that the northern beaches are famous for. Ahhhh. Although Zorritos is not famous for drawing giant marlins like Cabo Blanco once did, at its heart Zorritos is still a fishing village, with local fisherman heading out like clockwork to bring in the daily catch. Perhaps that’s why Zorritos still maintains a laid-back atmosphere; there are certainly tourists, but nothing like the beaches to the south. If you’re interested in heading to the beach with other people, Zorritos has a cute boardwalk located near the center of town, just a short walk from the Panamerican Highway. Check out the beautiful mosaic work! 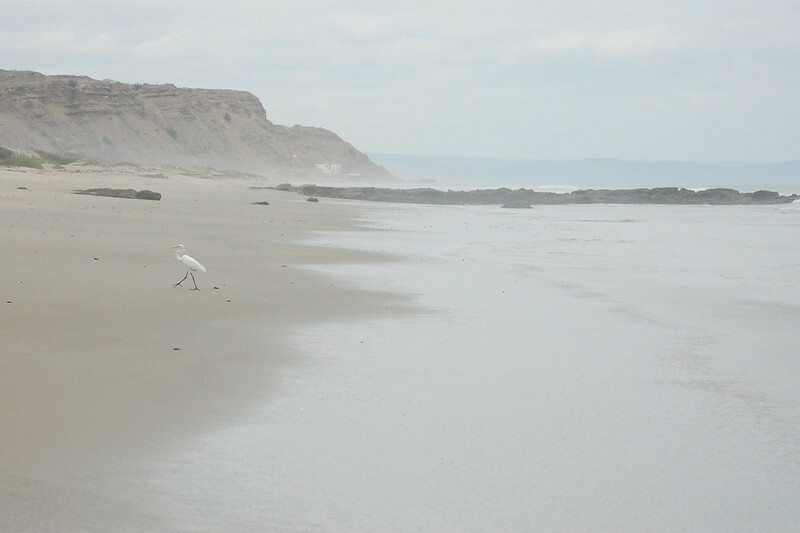 Although it was high season during my visit, the strange climate brought on by El Niño meant the beaches were a lot quieter than normal. In town, I talked to a few shopowners and they said that there was a huge decline in tourism, which is never good for a town that counts on a steady stream of revenue from outsiders. So I hope this little love letter to Zorritos inspires you to visit, even if the weather isn’t quite what you expected. Zorritos’ laid-back charms will win you over even despite the humidity! 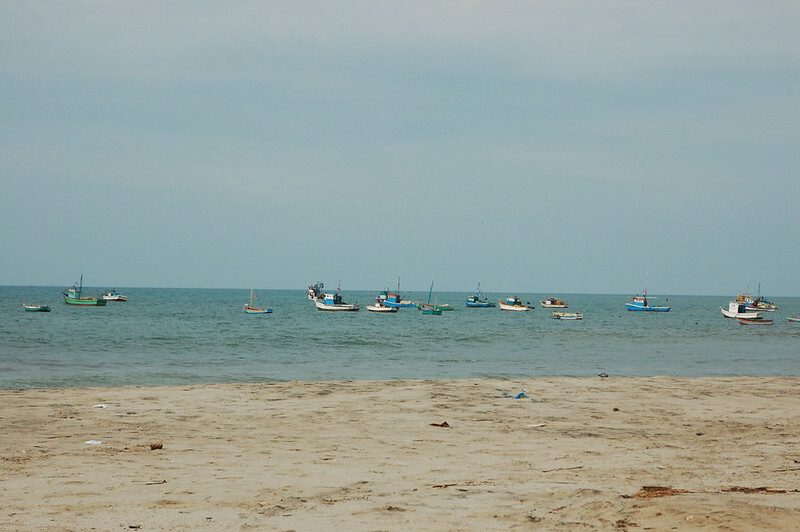 Heading north towards Tumbes, you reach a longer stretch of public beaches located in the administrative section of town. I appreciated the little handwritten sign: “No seas cochino,” or “don’t be a pig,” encouraging visitors to pick up after themselves. Although this boardwalk was unfortunately left half-finished, you can see how pleasant this wide stretch of beach is – open and accessible to everyone. With my packed schedule visiting the beaches further south as well as the ruins and mangroves to the north, I didn’t manage to find any time to hang out here and chose to stay close to my hostel (or if I’m really honest, my hammock). 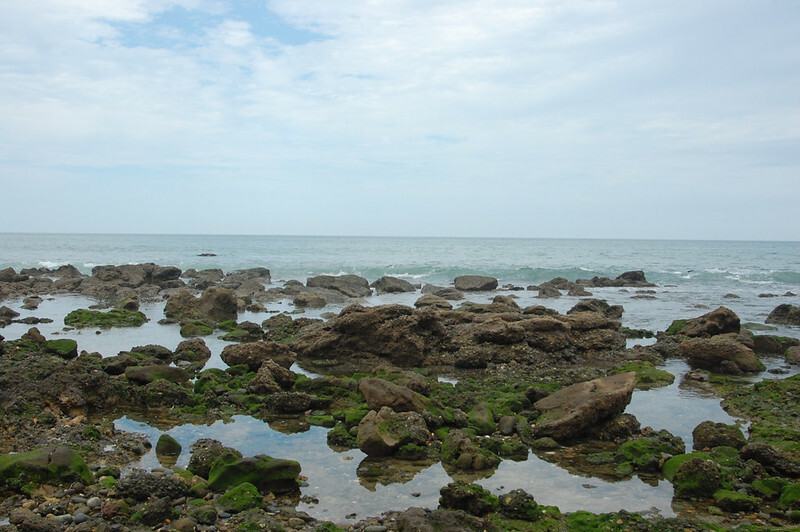 Besides beaches, the area around Zorritos is known for its hot baths. El Tubo, located in the area of Zorritos named Pampas de los Chivatos (Pampa del Aterrizaje), is a man-made geiser which has turned into a thermal bath. The geiser was created by drilling for oil, and when none was found, the community built a public thermal bath around it (just as in the highlands of northern Chile!). At night, the flame is lit and you can descend into the warm waters, soaking in the minerals and hanging out with friends, in my case, a large group of Spaniards, plus an Ecuadorian, some Peruvians, and me. 😉 El Tubo is located up a very bumpy road in the middle of the hills around Zorritos, so be sure to get a local mototaxi to guide you and bring a few people. Another common option for people interested in mud baths is Hervideros, located in the Bocapán section of Zorritos, close to the luxury resort Casa Andina. Once again, you just need to find a mototaxi to take you there. But if I’m being really honest about what I liked best about Zorritos, it was the sunset (well, the sunsets as experienced from the hammocks on the beach). In these parts, watching the sunset is a required ritual, no matter if you’re from the area or just visiting. Even on cloudy, dark days, the sun manages to beam through the clouds, turning unbelievable shades of yellow, orange, and red. With the heavy humidity in the air, the sunset took on a dreamy quality. Even on the days when I missed the sunset, I made sure to head down to the beach to appreciate the colors as they faded away into dusk. I’ve long been a fan of lingering after the sunset to see the skies change to purple and pink. Not bad at all. 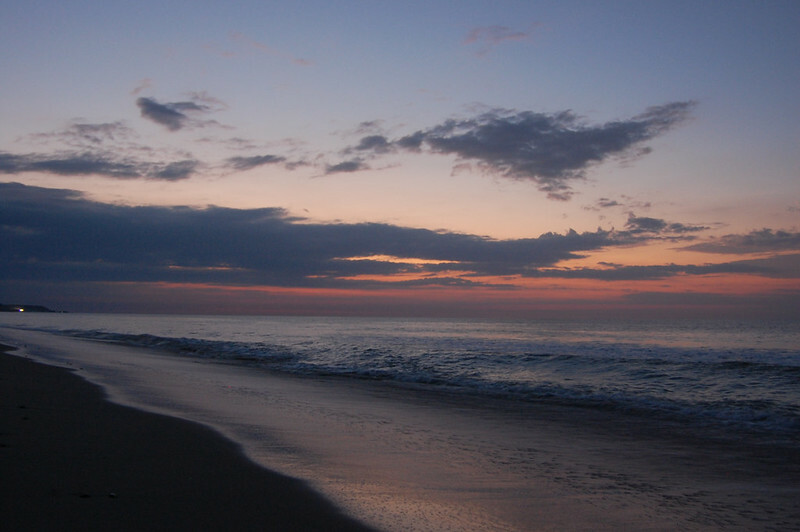 Seriously, who could complain about a beach vacation where every day ends like this? 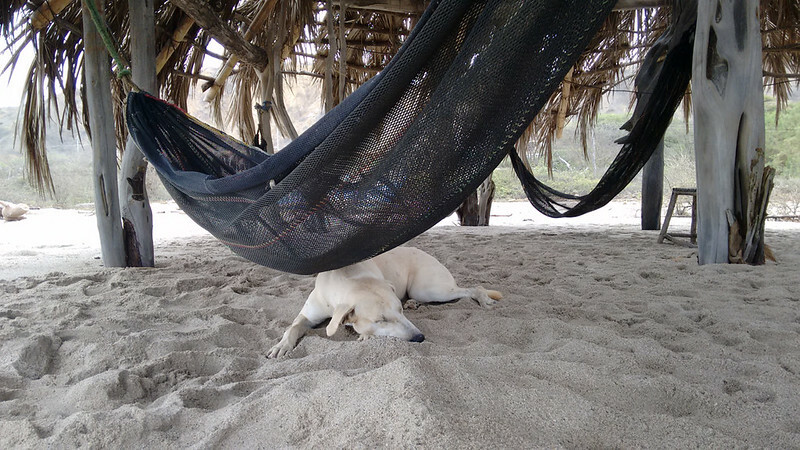 Maybe it was just the magic of finding the right place for me at just the right moment of my life, but Zorritos got under my skin and part of me still wants to be there, swinging in the hammock, right on the beach. All the more reason to return someday soon! 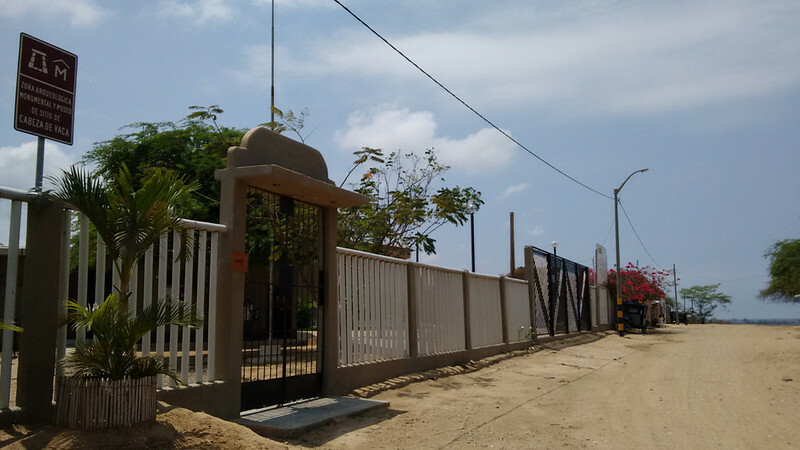 Zorritos is located right on the Panamerican Highway, and all the major buses to Tumbes have local offices in the center of town. I recommend traveling with Civa/Excluciva, as they usually have comfortable, well-kept buses and offer vegetarian options. I was a huge fan of Grillo 3 Puntas, where I stayed for almost a week. They offer private bungalows, even for solo travelers, and have an on-site restaurant where the owners cook up Spanish-style meals, always offering a vegetarian option. Although there is inside seating, everyone sits outside and enjoys the fresh air and views down to the beach. The included breakfast is pretty good and there’s also a bar, of course! Each bungalow has a hammock and there are lots of hammocks on the beach. They offer campsites for tents and campers, and there’s also an outdoor kitchen available to guests. If you stay there, just email them directly rather than booking online, as rates are better that way. In my research for this post, I came across a new surf hostel located closer to the center of town. Although I’ve never been there, it might be a good option if you’d like to be around more people or restaurants. Zorritos has a colectivo taxi stop in town, but there are usually a couple of seats on the colectivos heading north to Tumbes or south to Máncora. I never had much of a problem getting around, and the mototaxis can take you into town for S/.3. If you want to visit the thermal baths at El Tubo or Hervideros, check with the owners of your hostel or hostal as they likely have their own dedicated mototaxistas or taxi drivers. 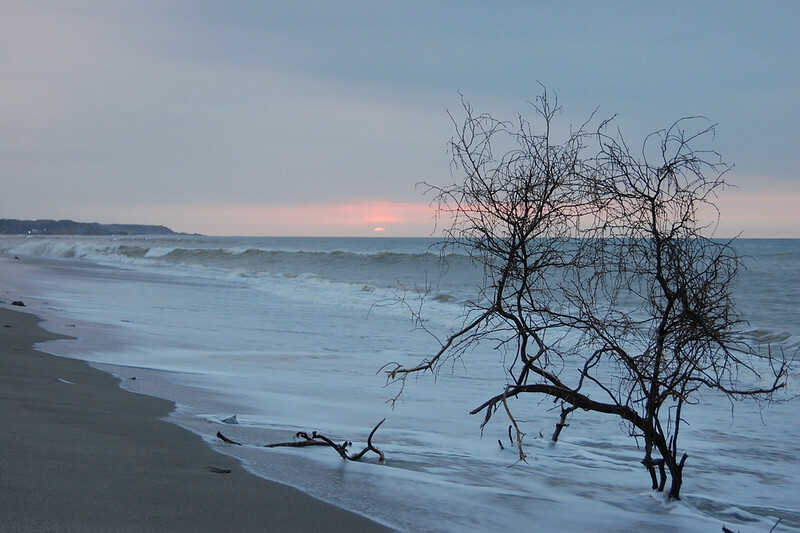 Zorritos is about 20 minutes from Cabeza de Vaca, 30 minutes from the city of Tumbes, an hour from Puerto 25 and the mangroves, 30 minutes from Punta Sal, an hour from Máncora, and two hours from Cabo Blanco. As long as you leave early enough, you can get just about anywhere. Be sure to get up early enough to go to the fish and fruit market in Zorritos, although you can buy fruit and vegetables from local businesses throughout the day. The fruit is amazing. 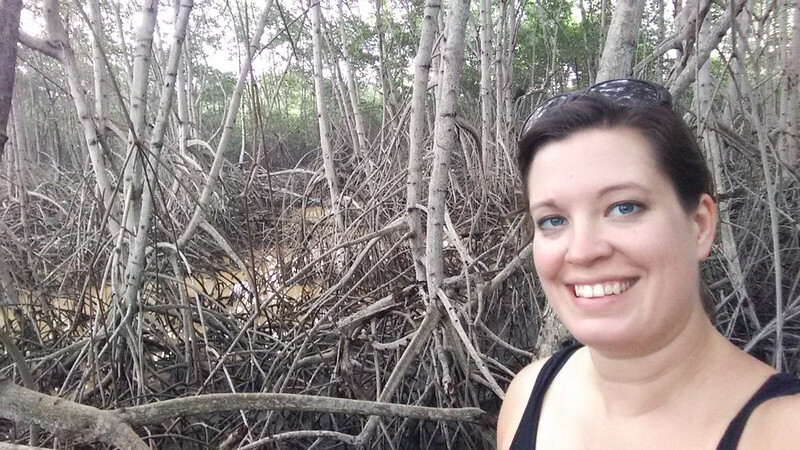 When I decided to travel to Tumbes, I knew I would be visiting lots of beaches like Máncora, Punta Sal, and Cabo Blanco, but I also wanted to be sure to round out my trip with a tour of ancient ruins and a foray into a fascinating ecosystem: mangroves. 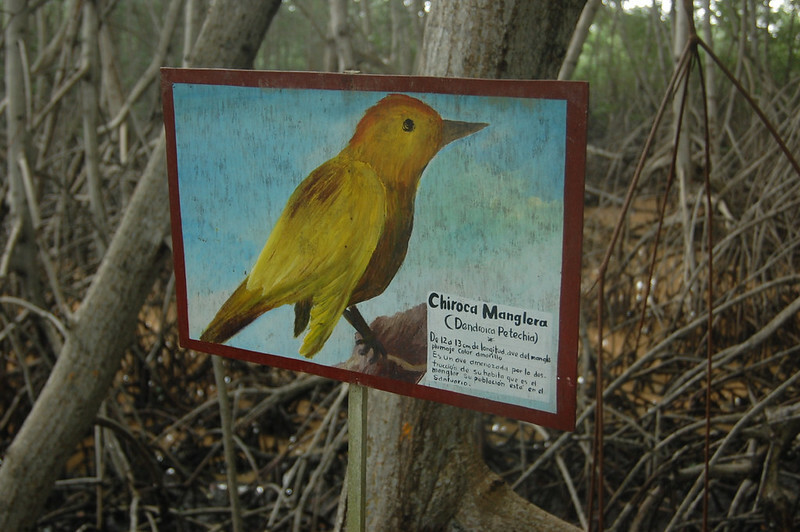 Since Tumbes has a subtropical climate due to its proximity to the equator, it is the ideal location for mangroves, known as manglares in Spanish. 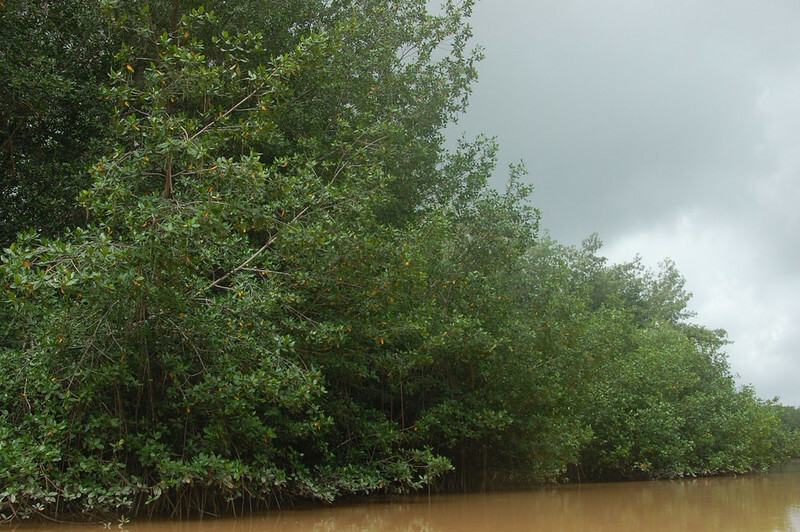 Mangroves grow in low-oxygen soil along the coastline where water moves slowly so that the roots can grow in the sediment. 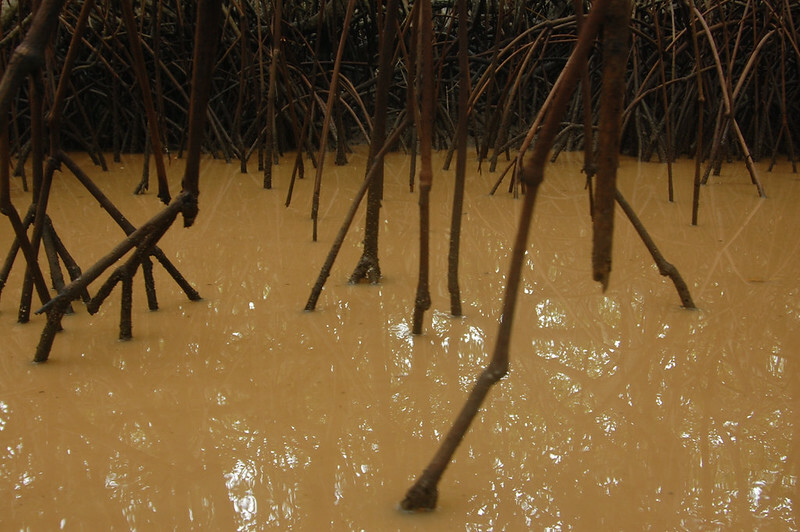 To be honest, I didn’t know much about mangroves before visiting the Santuario Nacional Los Manglares de Tumbes at Puerto 25. 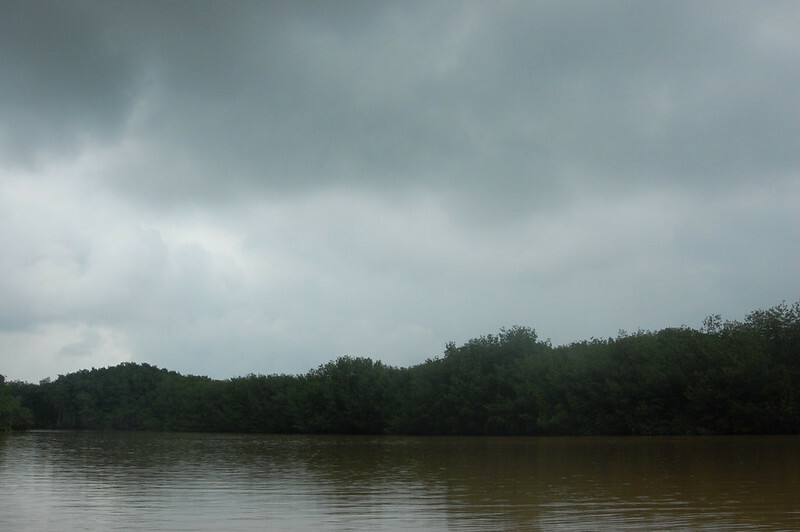 Puerto 25 is one of the primary entrance points into the mangroves; the other is Puerto Pizarro. Despite my interest, I almost didn’t make it there due to timing, but I’d befriended a couple in my hostel who worked on reforestation in the Amazon and they convinced me to join them on the tour of the manglares before catching my bus back to Lima. Tours are simple: you arrive to Puerto 25 by private car or a tour agency and head out into the water with your guide on these simple rowboats, just like the fisherman do. What’s nice about the tours is that they are run by locals with a strong connection to the ecosystem, as many people continue to fish for the shellfish that thrive in this environment. 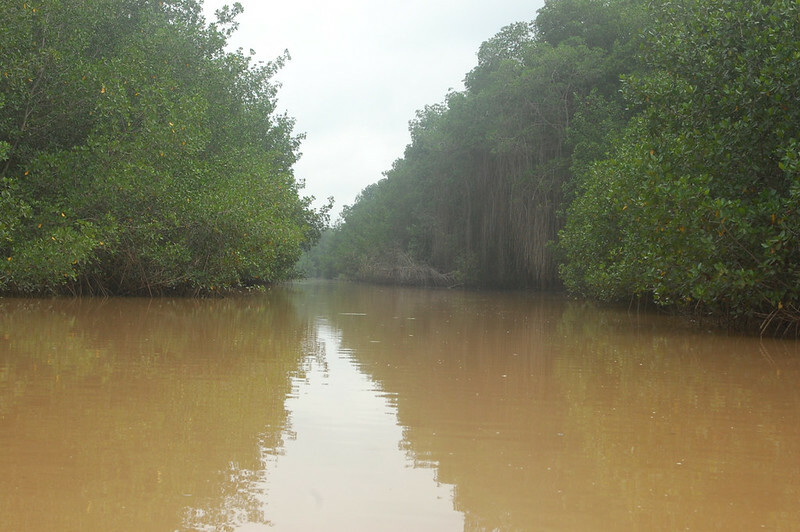 On our tour, I learned more about the mangroves as well as the animals who call this ecosystem home. The environment is incredibly peaceful; your guide paddles you slowly through the rivers, giving you a chance to observe the roots of the trees up close and take in the birds flying through the air. Our guide spoke frankly and honestly about the challenges that they faced in protecting this ecosystem, which had become a dumping grounds for garbage over the years. 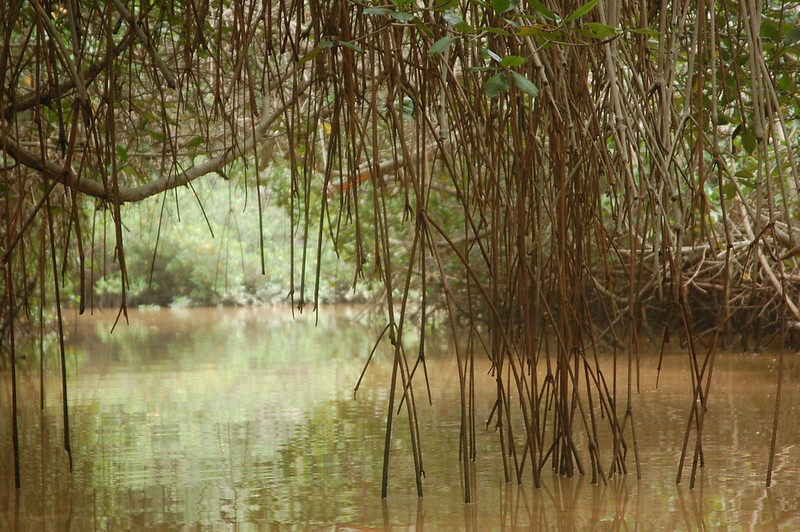 Since the mangrove forests extend into nearby Ecuador, there is a cross-border alliance working to clean up the rivers and waters in this natural reserve and educate people about protecting plant and sea life in this region, but there is still a long way to go. 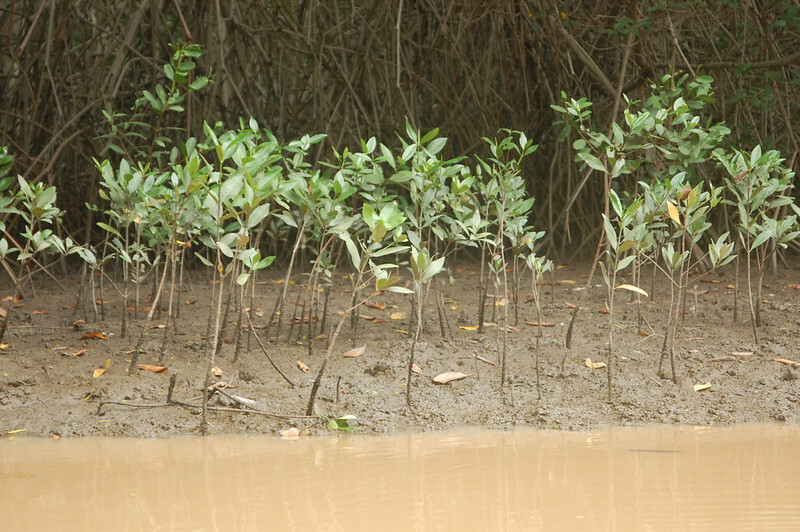 Thankfully, nature is resilient, and as you can see from these little seedlings, there is still plenty of hope for the mangrove forests! Such a unique type of forest, isn’t it? 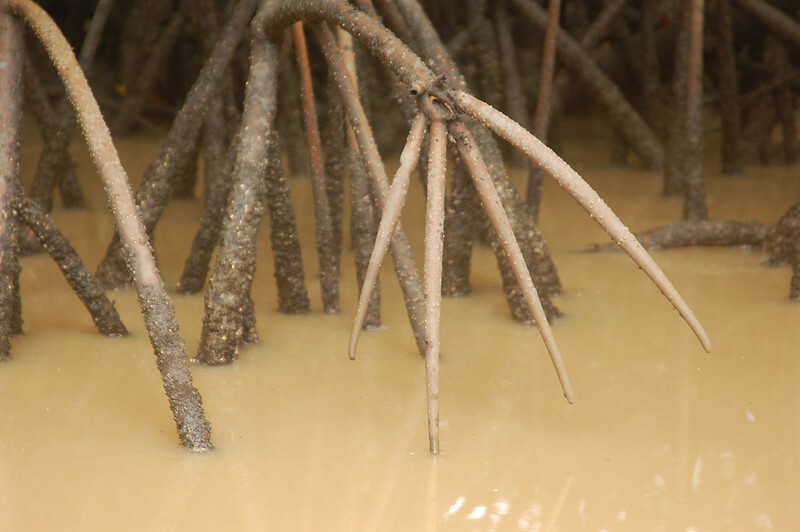 The roots stabilize the coastline and reduce erosion, and these stilt-like roots help the trees stay above the daily tides as they come in and out, although it’s hard to imagine rising and falling tides in such a still environment! After paddling through different channels, we got out of the boat to follow the educational nature walk set up by the Peruvian parks service. 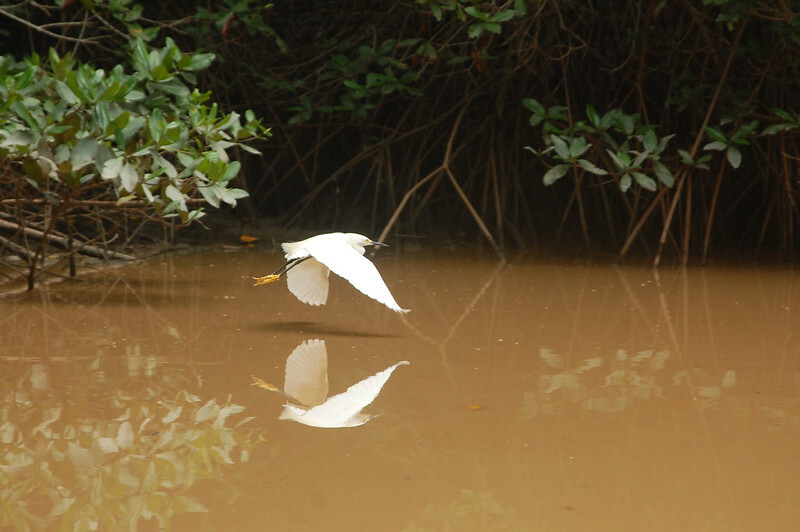 There is a bridge that leads deeper into the mangrove forest, where you can feel what it’s like to be surrounded by the tallest mangrove trees and learn about the birds and other animals that live in this type of ecosystem. Of course, I couldn’t resist taking a selfie to remember my visit to this very different type of landscape. I may love gardening and plants and hiking in green forests, but I had never seen anything like this before! Although mangroves do not have the visual wow factor of other forests, such as those in Valdivia in southern Chile, closely observing these tangles of roots does make you appreciate nature’s amazing diversity and adaptability! From there, we continued our loop back to where we had started, now all a little bit quieter, just taking in what it felt like to be on the wide brown river in this humid, jungle-like environment. And no sooner did we arrive back on shore than the skies opened up and the rain started pouring down around us! Thankfully, there is a little restaurant on site where you can eat the freshest fish in the area. My companions ordered up a feast and I swung in the hammock, appreciating the last few hours I would spend in the laid-back northern Peru vibe, at least for now! Go! As with many places in Peru, the more tourists visit this nature reserve and appreciate the ecosystem through tours with locals, the more protection manages to come through from the local governments. 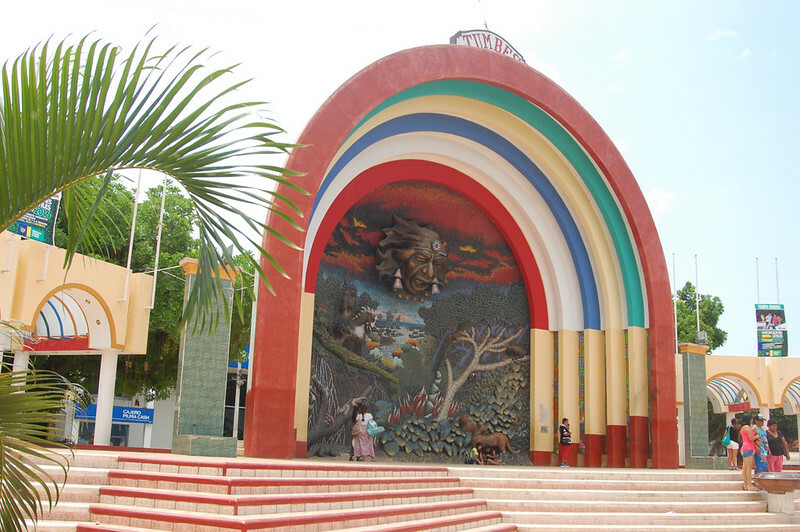 You can visit Santuario Nacional Los Manglares de Tumbes through tours departing from Puerto 25 or Puerto Pizarro, a beach and artisan fishing port that can be reached by public transportation from the city of Tumbes. The hostel I stayed at in Zorritos arranged for their dedicated driver to take our group to Puerto 25, which is a little more relaxed, as you can see from the photos. We visited on a very humid, cloudy day and we just missed being caught in a downpour; you might think about bringing a dry bag or at the very least a plastic bag for your camera equipment. I always carry a reusable vinyl bag which provides adequate protection from the rain. 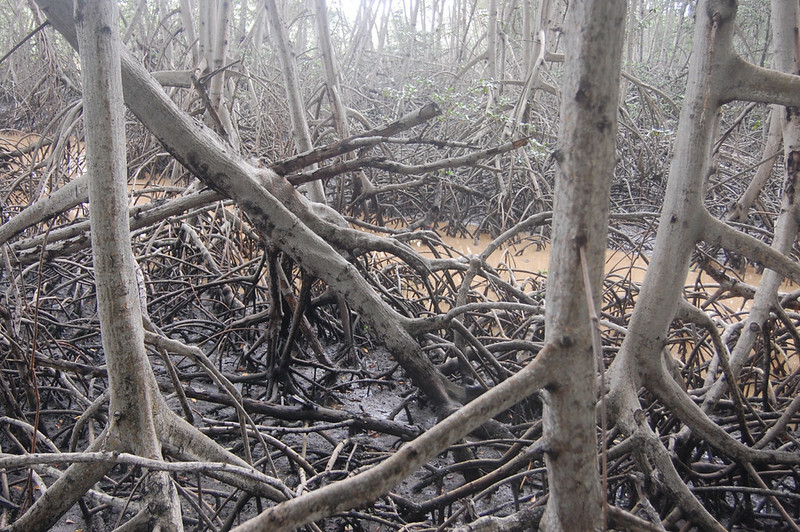 You can read a little more about mangroves in English here. At Puerto 25, there are bathrooms and an on-site restaurant with delicious food prepared from that day’s catch. As I mentioned, there’s even a hammock set up inside! The first time I visited Tumbes, I passed through the city around 4AM after a full day of travel through Ecuador. I’d left Baños on a bus to Cuenca, and as soon as I arrived in Cuenca, I booked a ticket on a night bus to Piura, Peru. After all I’d read about a dangerous border crossing between Huaquillas, Ecuador and Tumbes, Peru, I was a little wary of crossing in the middle of the night, but it turned out my research was outdated. The border crossing complex is modern, well-lit, and super simple: you get stamped out of one country and into another in the same room! So my first experience of Tumbes was subconscious, as I fitfully slept on a hot, stuffy night bus until the bus attendant shook us gringos awake, thinking we were heading to Máncora like most foreign tourists. 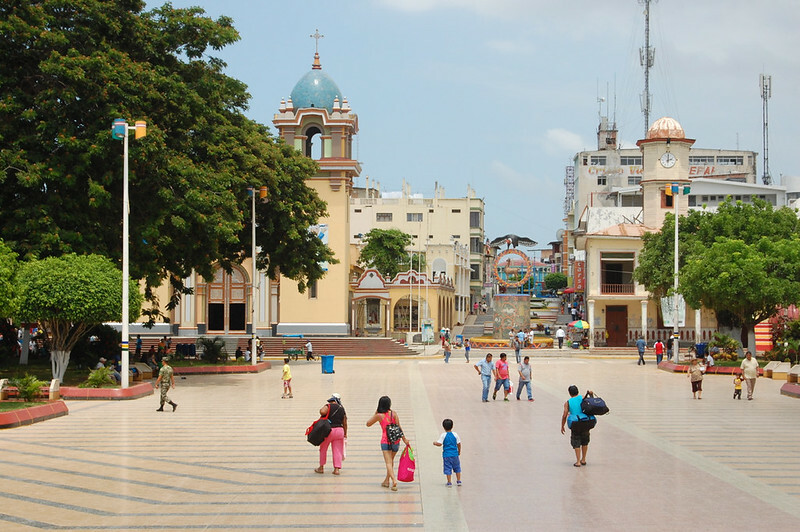 In any case, since I had missed exploring Tumbes and Piura on my first pass-through, I was determined to give Tumbes a chance to win me over me with its tropical charm, like my beloved Tarapoto. And win me over it did. As I researched my trip, I discovered that Tumbes is actually home to a massive pre-Incan complex of ruins pertaining to the Tumpis culture from this region. 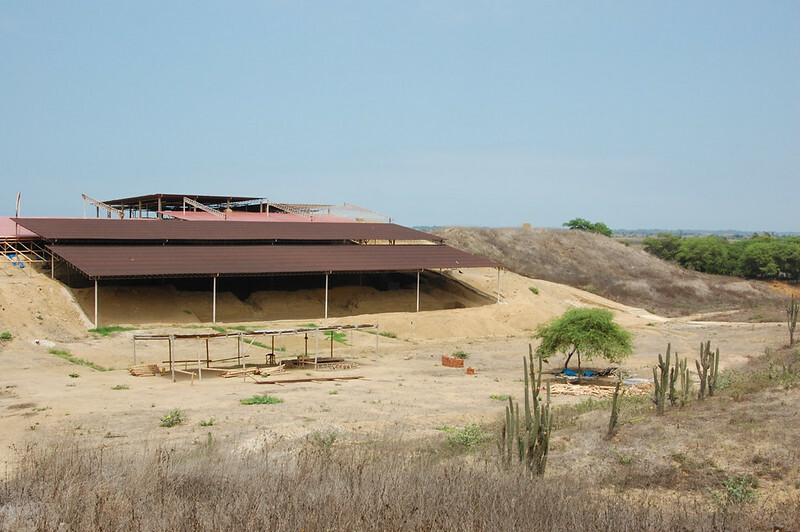 Located close to the ocean in a strategic position between the jungles of what is now Ecuador and northern Peru, the coastal desert, and the high Andes, this was an excellent place to construct a ceremonial and administrative center. So much so that the Incas took over the site when they grew their empire. 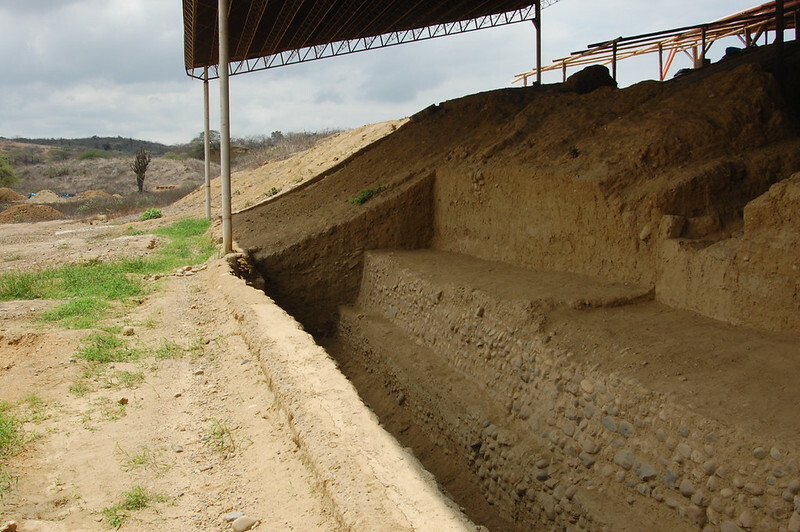 Despite the importance of this site in Peru’s pre-Colombian history, Cabeza de Vaca, also known as the Fortaleza de Tumpis, only was declared a national heritage site in 2000. Like many other desert ruins, the sand has covered the secrets of this temple and it’s hard to visually appreciate its former grandeur, unlike the massive rock structures of the Incas. 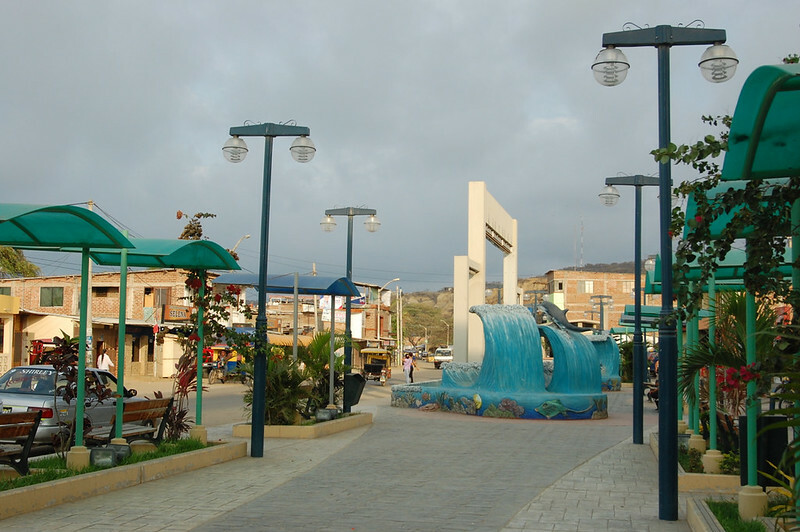 On top of that, Cabeza de Vaca is located in the Corrales district of Tumbes, which is a struggling community (much like Huaycán, where I volunteered in 2012-3). As in many parts of Peru, including Huaycán, this community has grown through land invasions. This means that many homes are actually built on top of the less obvious sections of the ruins, and it’s hard for the ministry of culture to protect them from damage. Because the ruins are only beginning to be excavated, studied, and understood, it is challenging for archeologists and the ministry of culture to get funding to protect the ruins as well as continue the investigation. There are many secrets beneath these layers of earth, but it is a painstaking process to understand why. 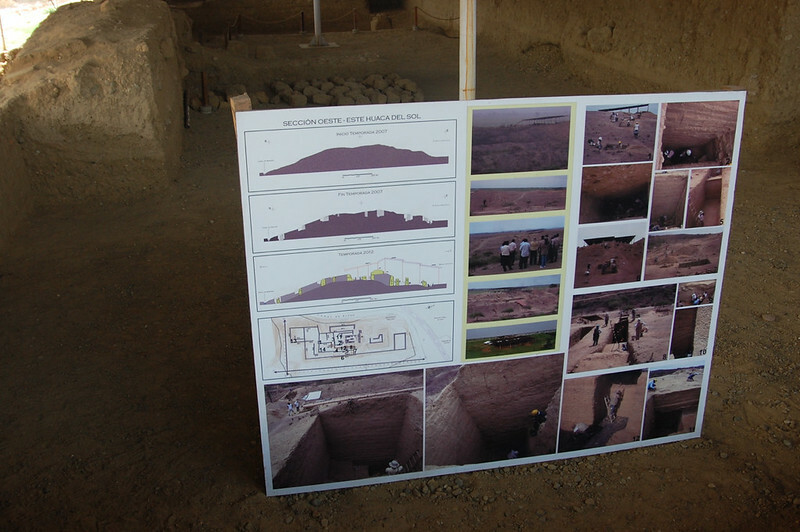 As you can see in this image, the interesting aspect of these ruins is that you can watch the process of excavation and see what new discoveries are being turned up as archeologists uncover and descend into deeper, better protected layers. You end up seeing something like this, some sort of canal. The early cultures understood how to construct canals in the most ingenious ways, and these ruins also have an extensive system. If you notice the walls in these photos, the brickwork is very different, suggesting the different eras of construction. 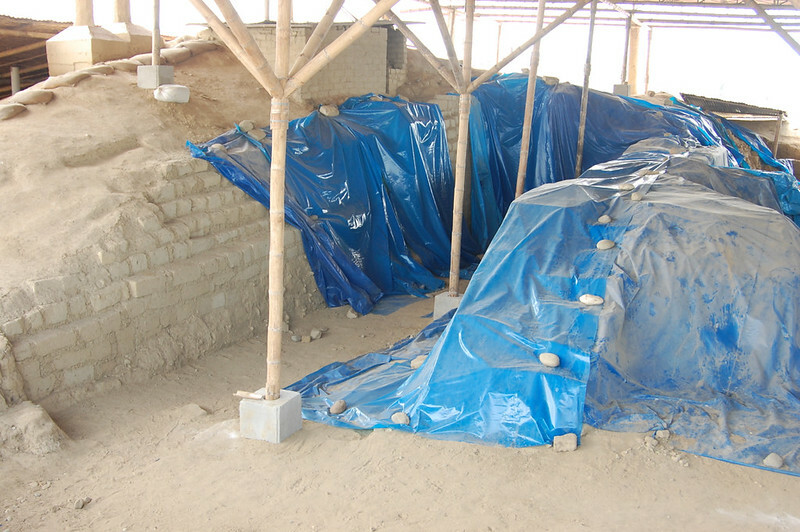 Unfortunately for me, the most recent excavations – and according to my guide, some of the most interesting – were actually being protected from the El Niño phenomenon and its rains by these tarps, so there wasn’t much to see. I’d be curious to return on a future visit to see how work has progressed. From the vantage point of these ruins located on one of the few hills in the area, you can see the expanses of fields being toasted by the desert sun. Further west you run into the ocean and the mangroves. And that’s the Panamerican Highway as it passes through northern Peru, just a simple two-lane highway in these parts. After my tour, we headed back to the museum to see some of the relics that have been uncovered during investigations. These shards of pottery do not look like much, but they are painted reminders of the ceremonial importance of this site. The most interesting piece in the museum, for me, was this fragment of adobe painted in what is very clearly the chakana, or Inca cross, a symbol common in artwork found throughout the Andes. The colors on this piece are quite vibrant given the passage of time, and as I’ve learned through my travels, desert ruins that were painstakingly painted in this fashion had deep ceremonial significance. 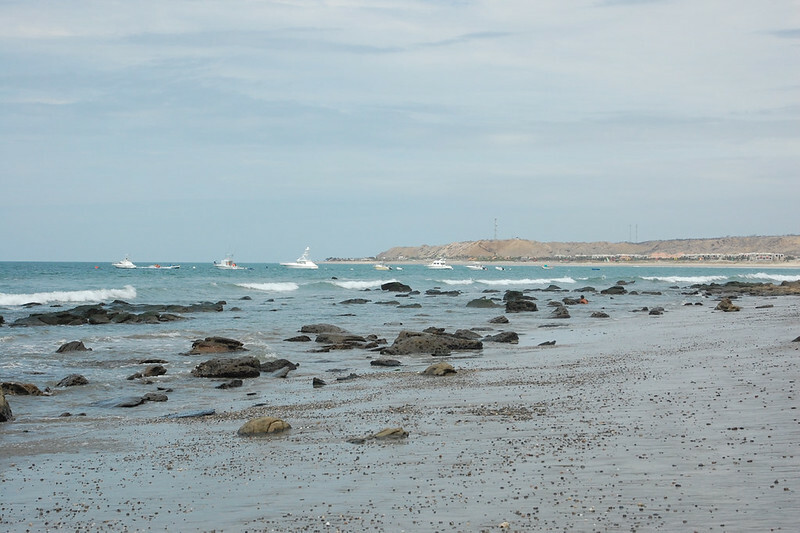 All in all, I enjoyed my brief but fascinating visit to Cabeza de Vaca, and I highly suggest that you make time to get here if you’re enjoying the beaches of northern Peru. It’s super easy to get to the ruins on public transportation – you get off any shared van at the crossroads to Corrales and hop in a mototaxi to the ruins. I provide more information in my recommendations, below. 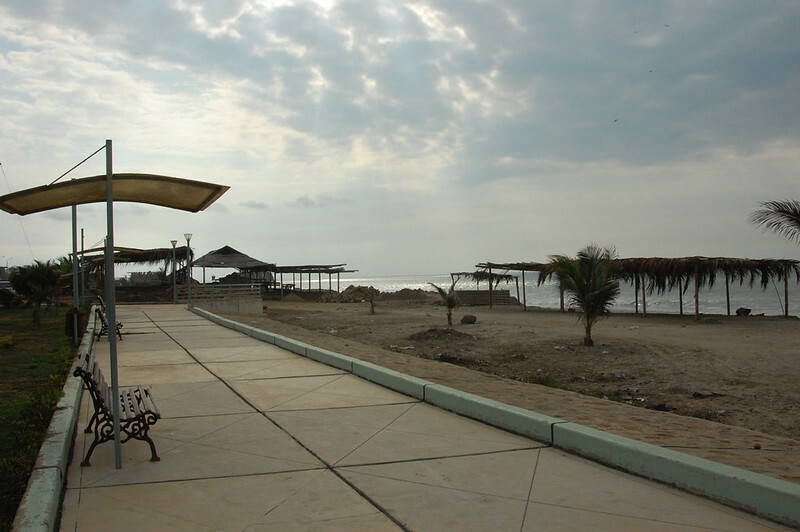 After visiting Cabeza de Vaca, I wanted to head into Tumbes to get to know the city and buy my return ticket to Lima. From Corrales, I took a mototaxi to Corrales’ main plaza, where I got another combi heading directly into Tumbes. By this time, I was starving, so I wandered around the main plaza looking for a restaurant with an appealing vegetarian option. Completely by accident, I stumbled upon a vegetarian restaurant! There is usually one vegetarian restaurant in every significant Peruvian city, and I find it’s a great way to get a sense of regional food tastes. Amusingly, I happened to get the last table in the restaurant, and so when a pair of relatives came in right behind me, I offered to let them sit at my table. Turns out it was their first experience with vegetarian food, and probably their first experience eating with a gringa in Tumbes! Sufficiently fueled, I continued wandering around the streets of Tumbes. The city center is compact and straightforward, so it is a pleasant place to spend the afternoon wandering around. The church on the plaza is pretty unique in construction style and reflects the colorful tastes of this region. Here’s another view of the Plaza de Armas, where you can see its colorful, unique arches. The inscription reads “Tumbes, cradle of South America’s petroleum wealth,” celebrating a major industry in these parts. Some of the buildings surrounding the plaza are relics from the colonial days – in the distance, you can see the balconies that are reminiscent of Spanish-style architecture. Behind the plaza, there is a raised pedestrian walkway where you can get views of the brown river and the bridge that leads into the city. 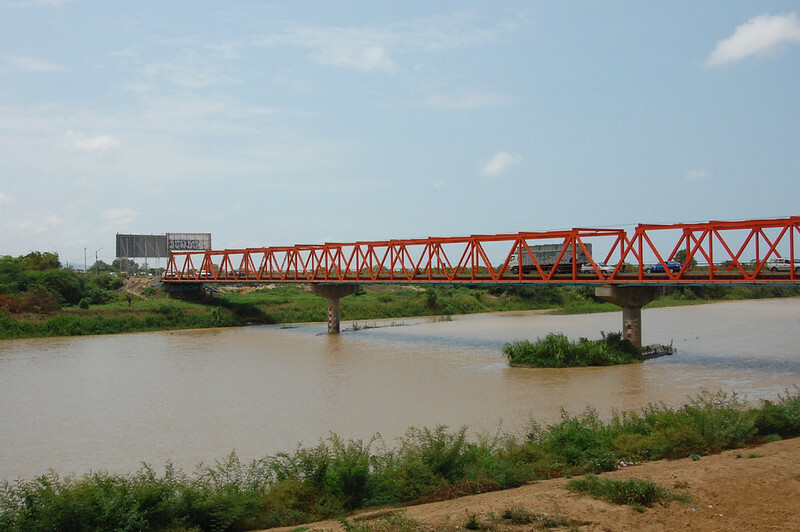 This bridge gets a lot of traffic as it is part of the Ruta Panamericana. You can see that the plaza was pretty empty due to the hot summer sun and humidity – everyone was hiding out in the more shady parts in the distance! My favorite part of the plaza was this amazing mosaic built into the band shell right on the plaza. I was fascinated by its symbolism, really representing the spirit of the region. 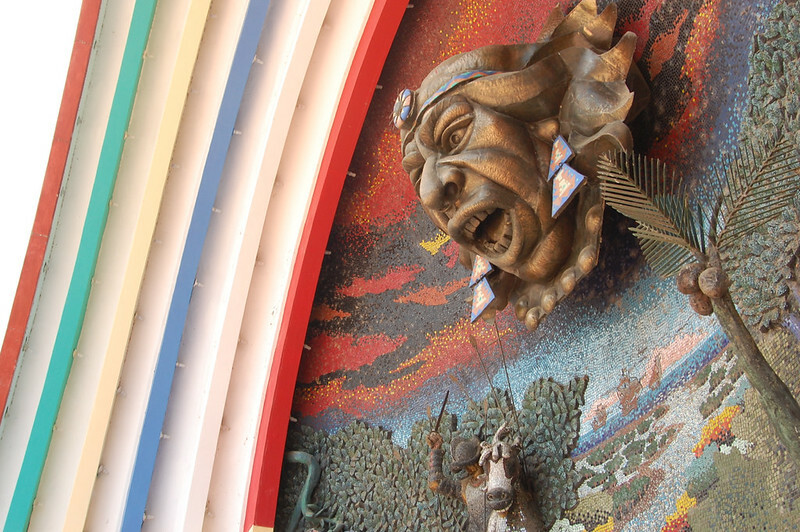 As I wrote in my Instagram post, this mosaic is called “Encuentro de Dos Mundos,” a slightly nicer way to say “Two Worlds Collide.” In this detail shot you can see the force of Chilimasa, chief of the Tumpis, resisting the Spanish colonizer in the battles among the lush landscape of the mangroves in Tumbes. This same spirit of resisting, surviving, and gathering strength continues today throughout Peru. 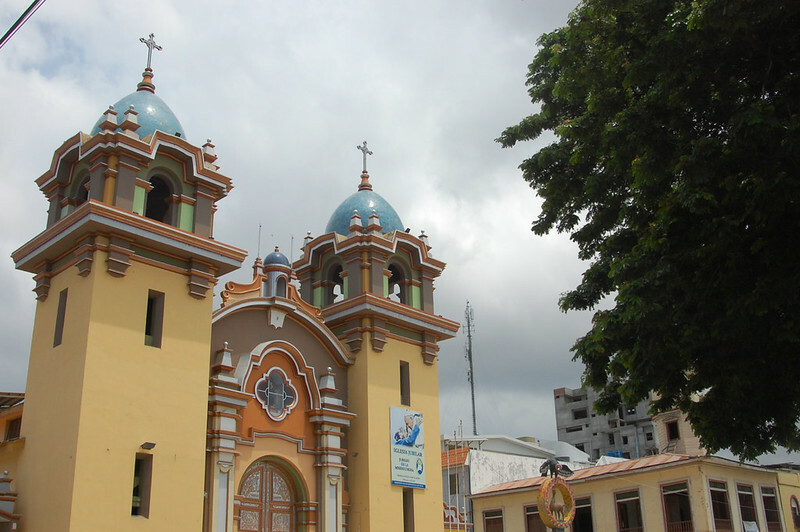 Last but not least, Tumbes has a lovely pedestrian walkway that runs along the church where you can also take in the widely varying architecture, do some shopping, and buy some fruit, as I did (mangos are amazing in this region!). Interestingly, this part of the city is pretty peaceful considering the chaos back on the Panamerican just a couple of blocks away. 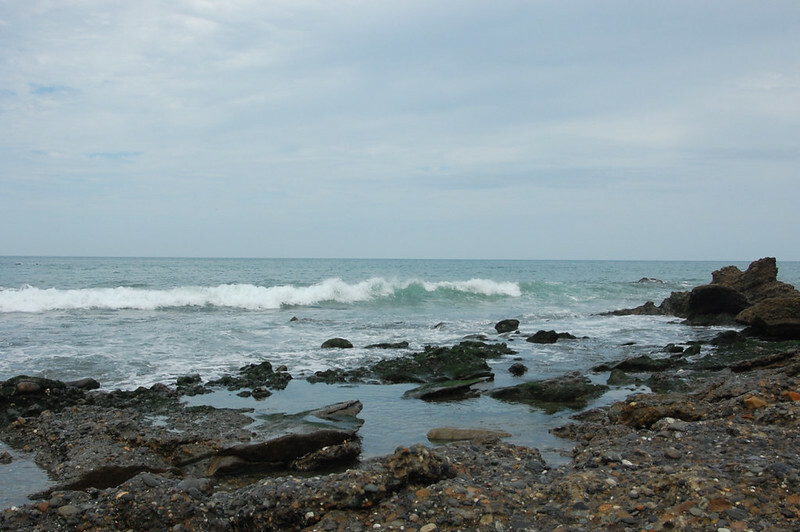 Near here, you can catch a bus to Puerto Pizarro, one of the fishing bays and beaches located close by. Puerto Pizarro is also one of the most common gateways to the mangroves, although I went on a tour from Puerto 25. 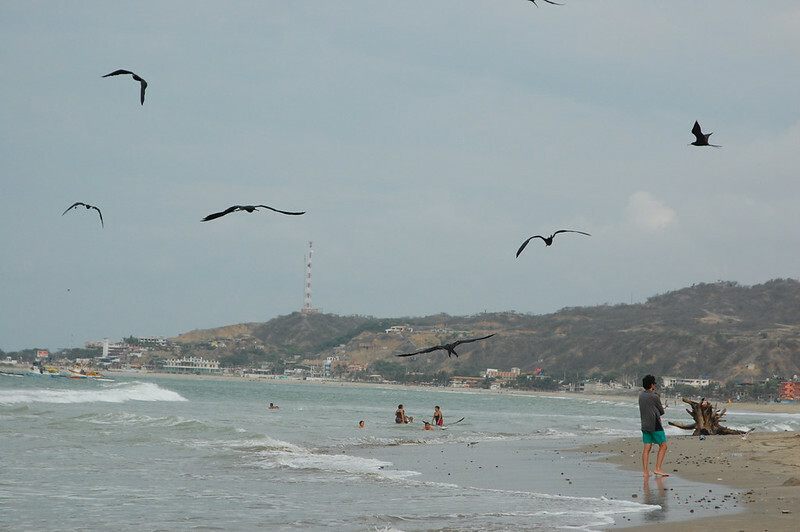 As you can see, Tumbes is a great place to spend an afternoon getting to know a different aspect of Peruvian culture. I would have spent more time there, but I was looking forward to watching my last sunset in Zorritos. 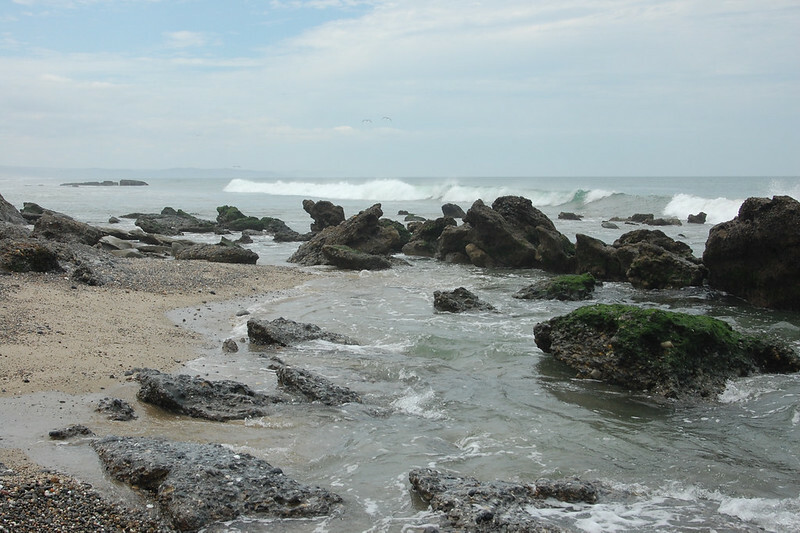 If you have time in your travel itinerary, make some time to get to know Tumbes and the surrounding area. Most travelers skip Tumbes and head directly to Máncora, but Tumbes can help broaden your perspective on life in this region. 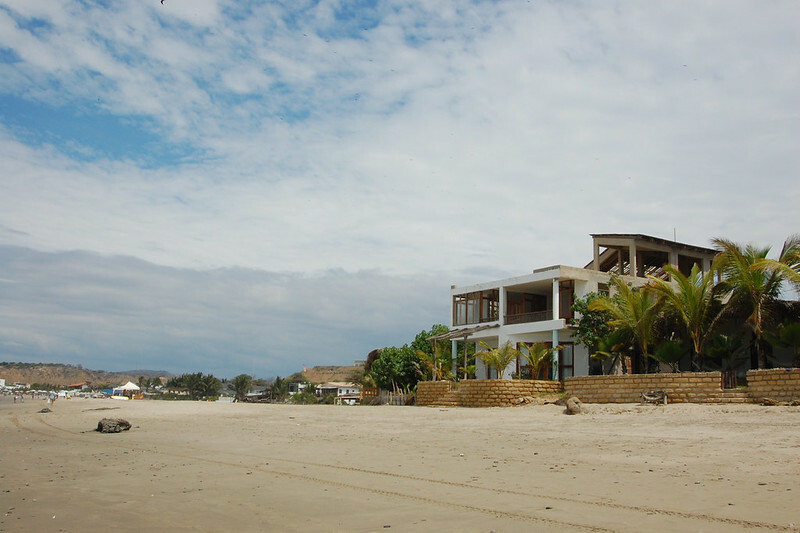 I suggest staying in Zorritos, located about 30 minutes from Tumbes, and using that as your base. 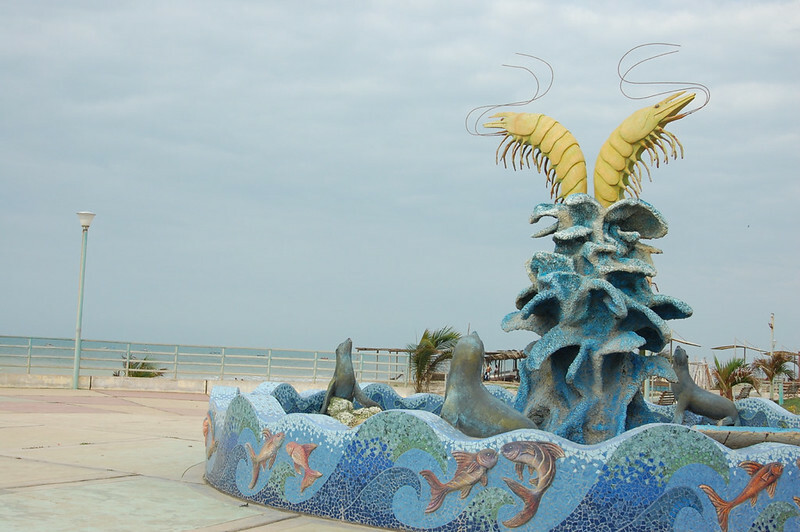 Tumbes is the first city you reach when crossing the border from Ecuador at Huaquillas. Contrary to the outdated information you may find in your Google search, the border crossing is now totally secure and easy as long as you have a through bus from Ecuador to Tumbes or Piura. 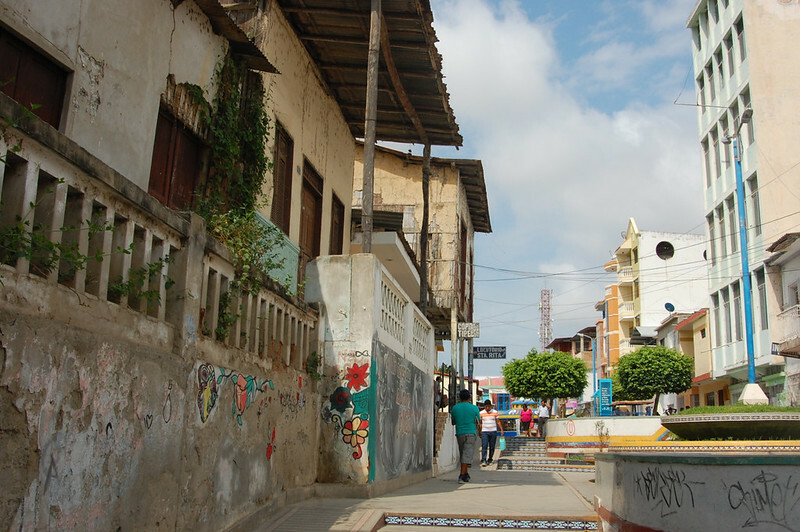 Tumbes is a border city so it has its pockets of unsafe areas, but downtown Tumbes is perfectly safe to wander around and quite a pleasant place to spend an afternoon. 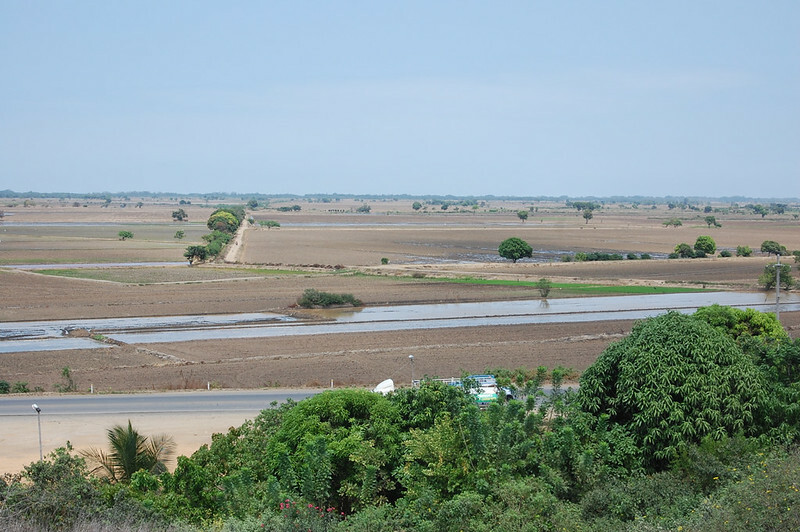 To visit the mangroves near Tumbes, you can catch a colectivo to Puerto Pizarro from the center of Tumbes at the stop shown in Google Maps. Although I didn’t visit myself, the locals I ate lunch with said it was well worth a visit. 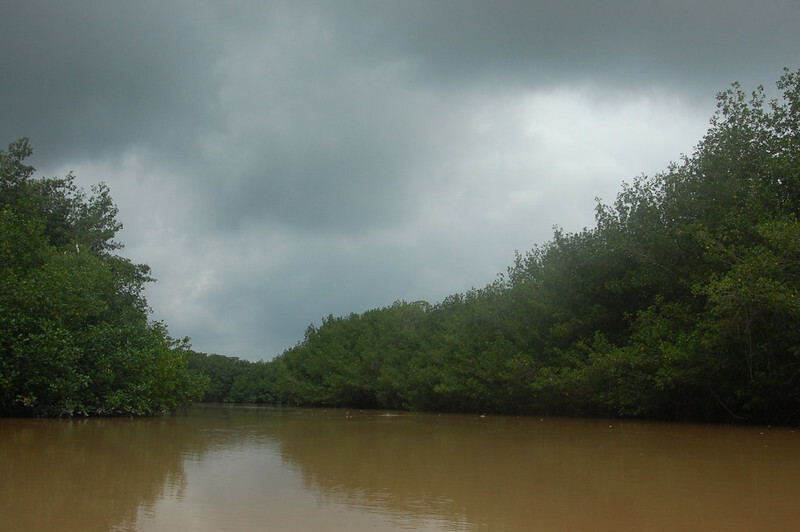 Personally, I visited the mangroves on a guided tour from Puerto 25, arranged by my hostel. That was totally worth it as well to see such a fascinating ecosystem. If you have any interest in pre-colonial, pre-Incan cultures, visit Cabeza de Vaca, also known as the Fortaleza de Tumpis, located in the district of Corrales on the outskirts of Tumbes. Note that Corrales is a developing community or shantytown where many homes have been built through land invasions, but as long as you don’t flash your camera or other symbols of wealth around, it’s perfectly safe. To get there, take a shared van to the crossroads of Corrales and find a mototaxi to take you to the ruins. It should cost S/.2-3. 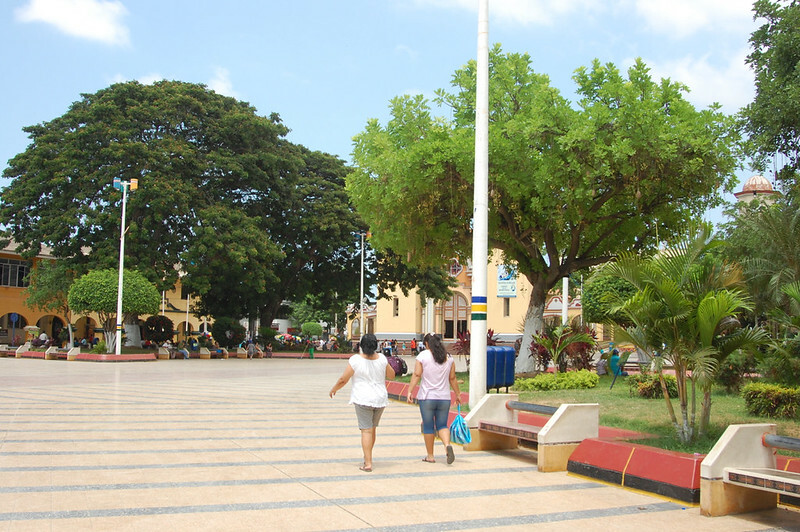 When you leave Cabeza de Vaca, you just walk back to the main road and flag down another mototaxi to head to the plaza of Corrales (if you’re going to Tumbes), or to the Panamerican, if you’re hoping to head back towards Zorritos or the beaches in Piura. The bus from Corrales to Tumbes costs S/.1 and runs frequently. 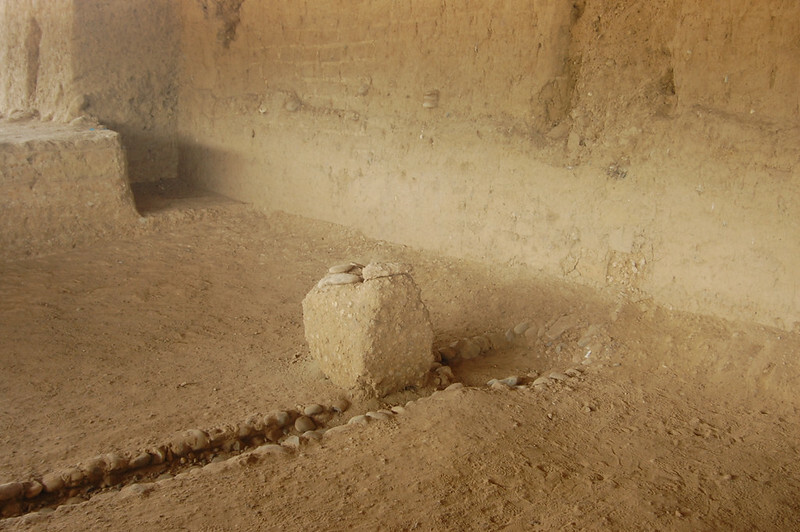 As I mentioned above, Cabeza de Vaca is still seeking funding for its excavation and protection, and more tourist visits can help with this process. There is not too much visible, but it’s worth it if you’re interested in learning more about pre-Incan cultures. The Paseo Jerusalem is a lovely pedestrian walkway continuing to the park. All around Tumbes there are lovely mosaics and artistically constructed stone buildings and overpasses. It’s a pretty fascinating city to walk around. You can catch a van back to Zorritos or onward to Máncora from the Panamerican, but it’s a hectic street so you might want to ask a local for some help. If you’re traveling to Lima, I suggest Civa, whose office in Tumbes is located on the Panamerican. You can get on the bus in Tumbes or in any of the beach towns along the way. They have a vegetarian menu and the food on the route from Tumbes was generous – a giant tortilla with plantains and rice, yum! 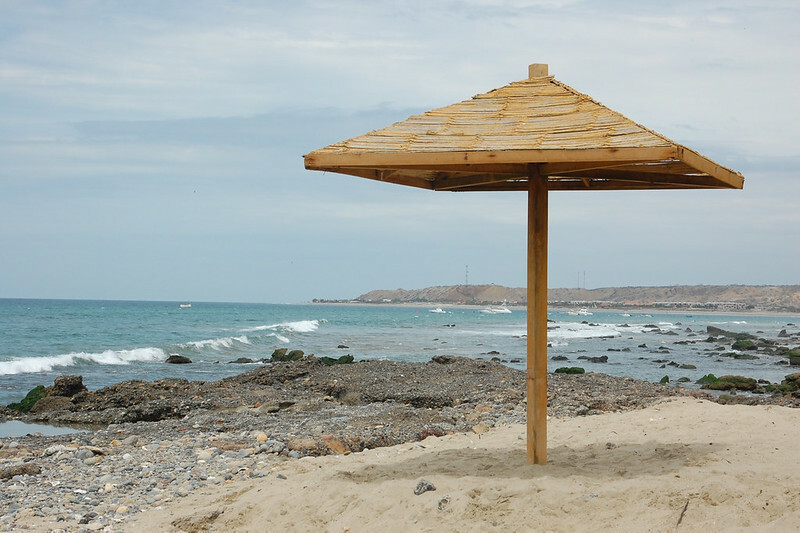 When you think of luxurious beach resorts in northern Peru, what comes to mind first? If you’re like most Limeños, you think of Punta Sal. 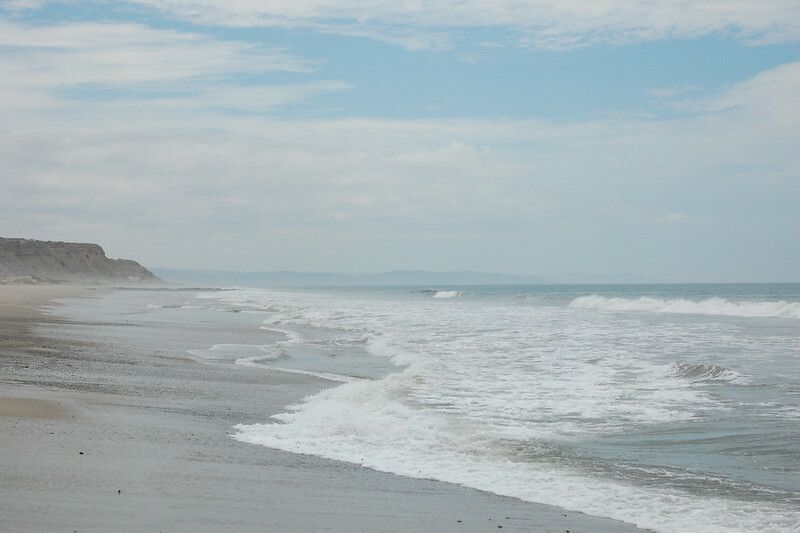 You might head to nearby Máncora for a night on the town or a fancy meal, but the truly exclusive stretch of beach in these parts is Punta Sal. Many years ago, Punta Sal was the secret getaway for rich Limeños, who were able to invest in building vacation homes on beachfront properties, and over time a number of luxury hotels have sprung up along the coastline. 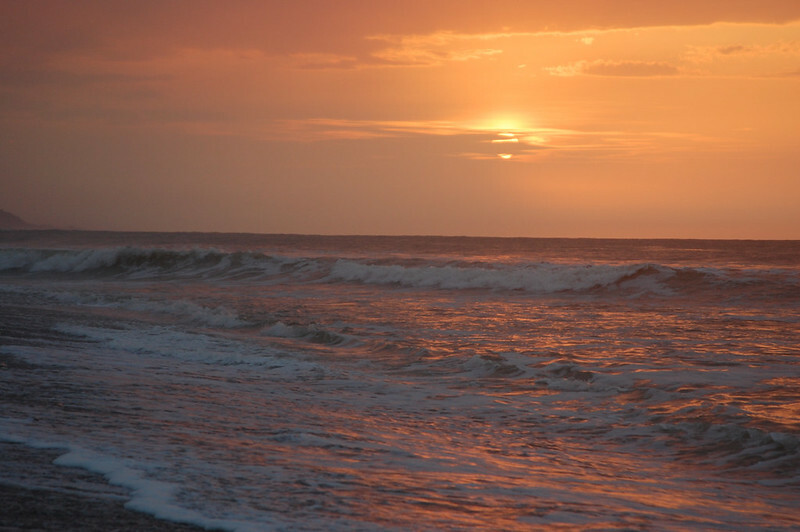 Because the area occupied by Punta Sal is so expansive, there plenty of resorts located away from the crowds, a quick drive or taxi ride away from the center of town. The good news for travelers like myself is that Punta Sal’s magic is easily accessible and available for people of all budgets. It’s against the law to prohibit access to water and carve away private beaches, so these long stretches of sand are open game for visitors. Even still, Punta Sal does require a commitment to visit. If you have a car, life is easier; you can drive down to the waterfront, passing through a security control as you leave the Panamerican Highway. If you’re coming on public transportation like me, don’t worry, there are plenty of mototaxis and shared colectivo taxis waiting to take us down to the water. 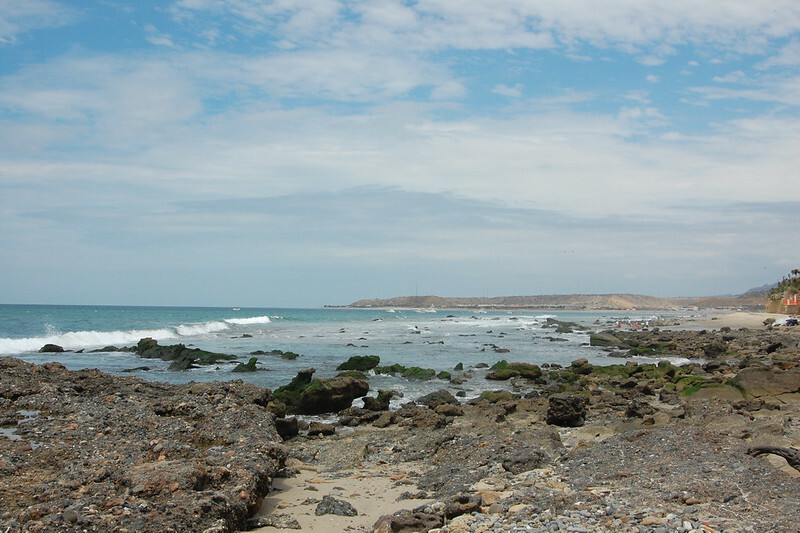 The frequent shuttles between Tumbes and Máncora pass right by the entrance to Punta Sal. 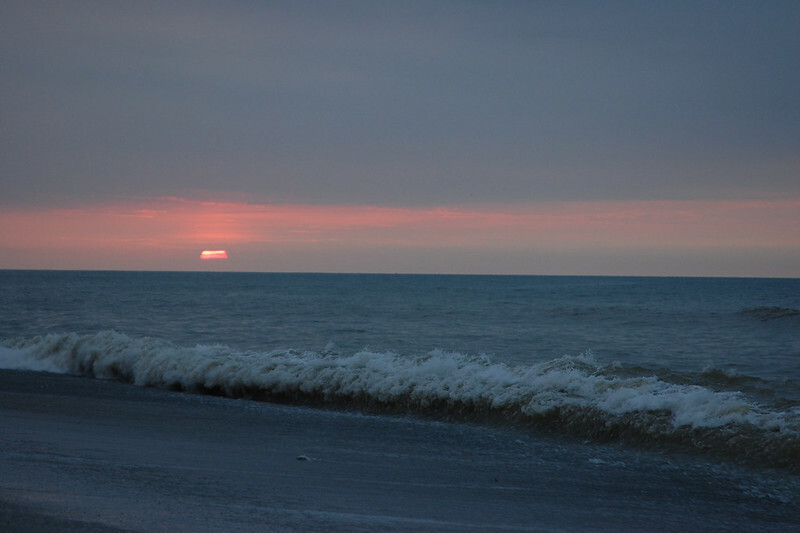 Although there are miles and miles upon MILES of accessible coastline throughout northern Peru (as well as several beaches like Canoas de Punta Sal that are close to the highway and perfectly nice places to spend an afternoon), I suggest you check out Punta Sal for yourself. You can hang out with the crowds right at the entrance to the beach, or you can do what I did and spend about 30 minutes wandering down the coast, accessing your own exclusive beaches. As you keep walking past the vacation homes, you’ll see only a couple of hotels along the way, and then suddenly, you’ll just see the cliffs behind you. But if you’re like me, you’ll be paying more attention to the beautiful pristine ocean views spreading out in front of you. Although this region is known for its year-round sunny skies, the El Niño phenomenon meant there were a lot of clouds during my visit, but thankfully, the skies started to clear as the day went on and I was able to appreciate the sunshine and blue skies. There are lovely pockets of rocks where you can relax in the warm pools of water, as the gentle waves flow over you. It was here that I ran into a friendly couple saying they’d found their throne, and asking me to snap a picture of them appreciating this natural luxury. For the record there were only about five people on this stretch of beach! 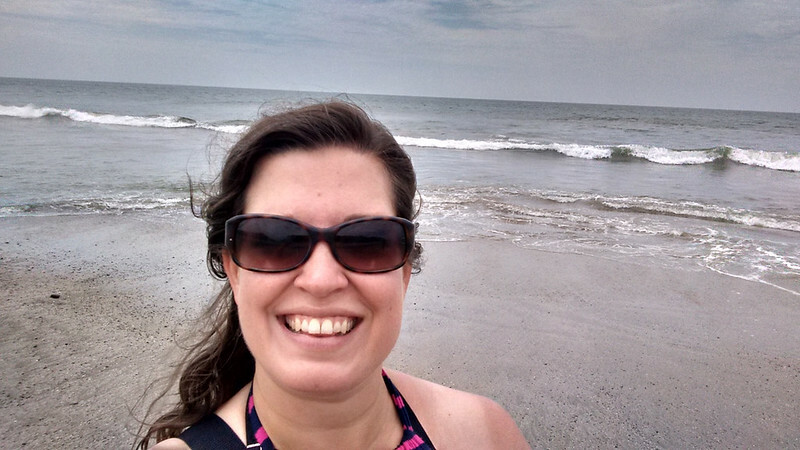 Continuing along my way, I chose to just observe the vastness of the ocean. I watched the seabirds flying over the water and waded into the water. For some reason, when I travel, I appreciate this sense of near-isolation, as it provides me a chance to truly take in and appreciate our natural surroundings and the wide, wide world we live in. Seriously, is this an exclusive beach or what? You could spend the whole day just listening to the waves crash on the shore while reading a book in the soft sand. Awww! I thought this little guy was so adorable. 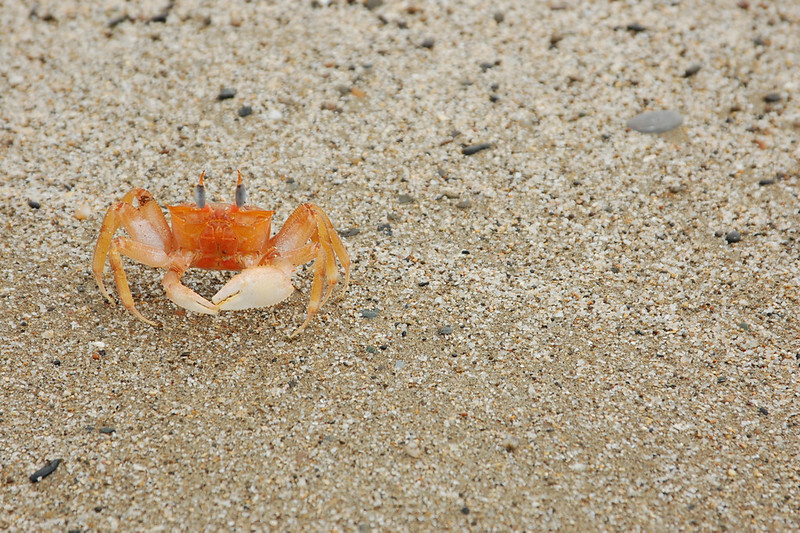 I forget his name in Spanish, but it translates to something like “useless crab” because he’s not one of the ones worth eating! This photo also shows you just how amazingly fine the sand is. This makes the beach pretty pristine! As you can see from this photo, I was pretty joyful wandering along the shore, enjoying the privacy of an exclusive beach all to myself. While I was soaking it all in, the couple I met earlier caught up to me and invited me to have lunch with them in their family’s beach house! Yet another one of those random travel opportunities, and a chance to experience the luxury of Peruvian beach culture from the inside. As I mentioned on Instagram, I felt rejuvenated from hearing the stories of people two and three times my age and connecting for a brief moment in time. After a lovely afternoon on the beaches of Punta Sal, it was time to head back to my hostel in Zorritos. I was totally smitten with Punta Sal’s more hidden corners. If you decide to visit, be sure to leave the main stretch of beach and keep on walking to the sandy white beaches just a short wander away. Although I was not a fan of overrated Máncora, I would still argue that it’s worth visiting Punta Sal. Unless you’re staying in one of the luxury resorts right in Punta Sal, you’ll probably base yourself in Máncora, or, if you’re like me, Zorritos to the north. 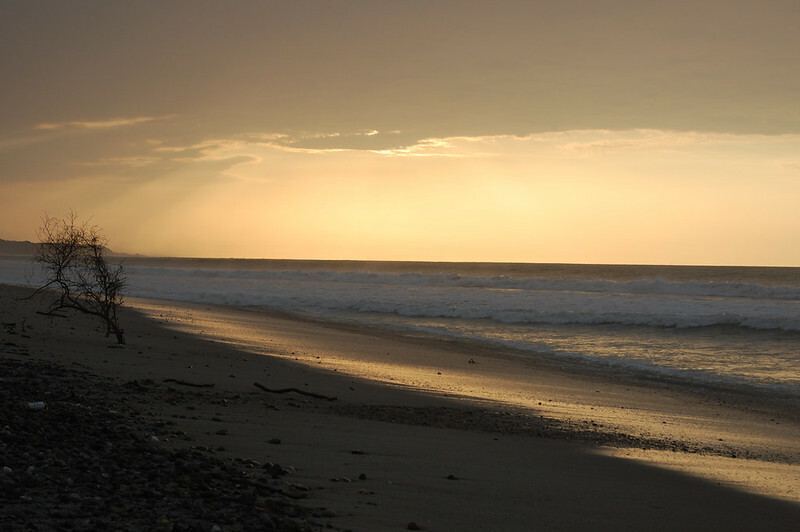 There are frequent van shuttles (combis) that run between Tumbes and Máncora, as well as some that do the shorter, more lucrative run just between Punta Sal and Máncora. Just wait for a bus on the Panamerican Highway. To enter Punta Sal, get off your bus at the entrance shown in the photo below. There are mototaxis waiting to take you down to the beachfront that cost about S./3. You’ll have to pass a security checkpoint, just a way to keep that exclusive feeling within the community. The mototaxi will drop you off at the main entrance to the beach. Although I didn’t spend much time wandering around the main part of town, I noticed a number of restaurants and other shops. Walking food vendors are technically not allowed on the beach so you’ll have to head into town to buy a snack. 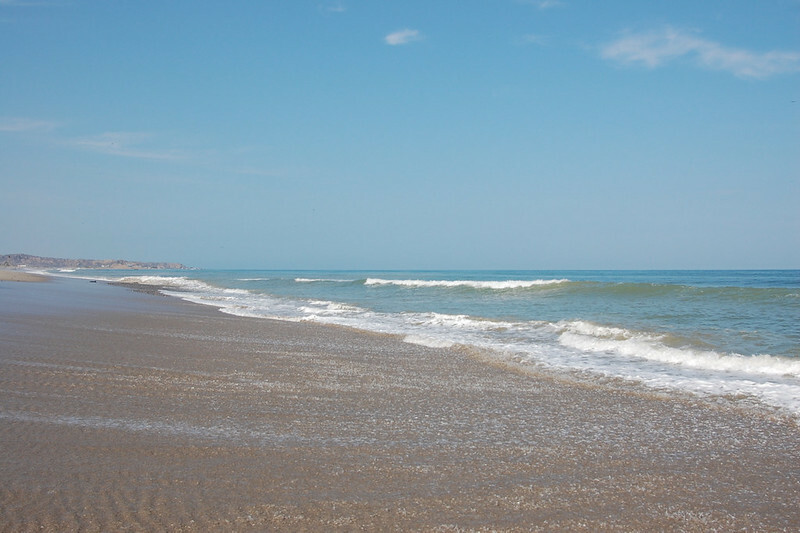 As I have mentioned a few times, be sure to walk beyond the main section of public beach in the direction of Máncora, past the resorts and vacation homes, and get to the wide open stretches of beaches with very few visitors. It only takes about 30 minutes to walk that far but the pristine sand is totally worth it! There are several other beaches in the area. 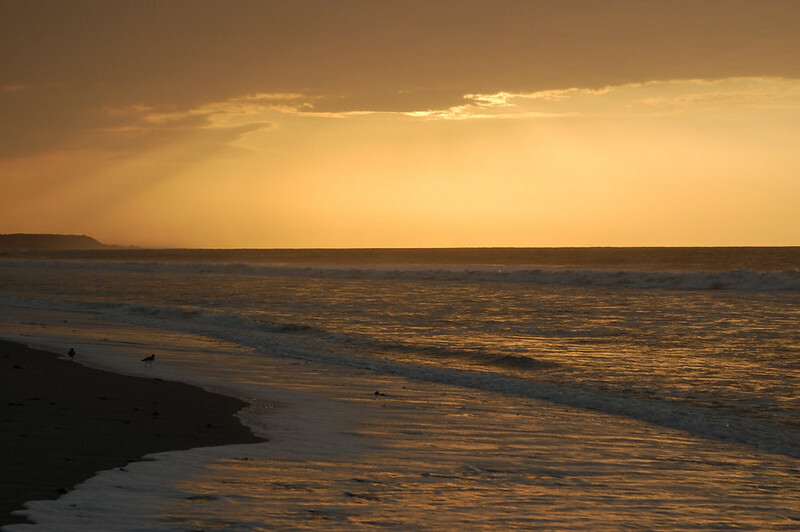 The exclusive resorts are located to the north of the public beach and even have their own special entrance. 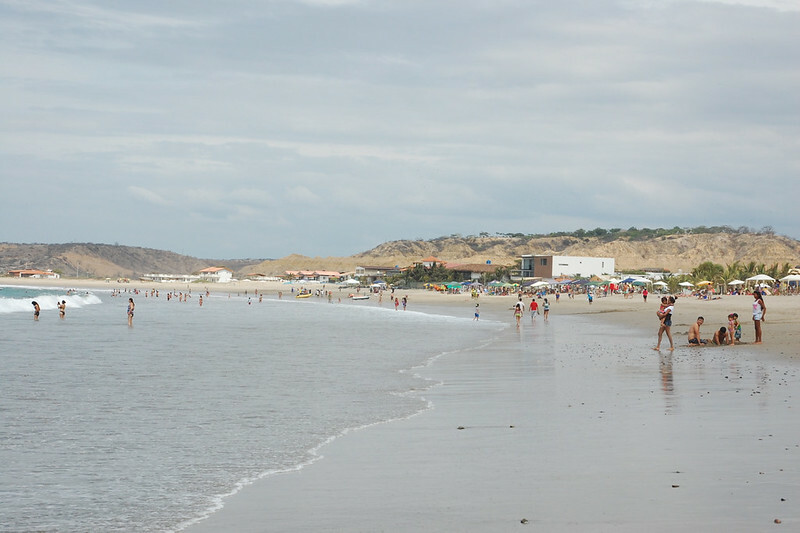 You can also reach the beachfront by stopping in Canoas de Punta Sal, also known as Cancas, and you’ll notice that Tumbes locals tend to enjoy the beaches there. They aren’t too crowded, are right off the Panamerican, and there are lots of small shops on the route. You can see a map and some information about entry points (in Spanish) here. 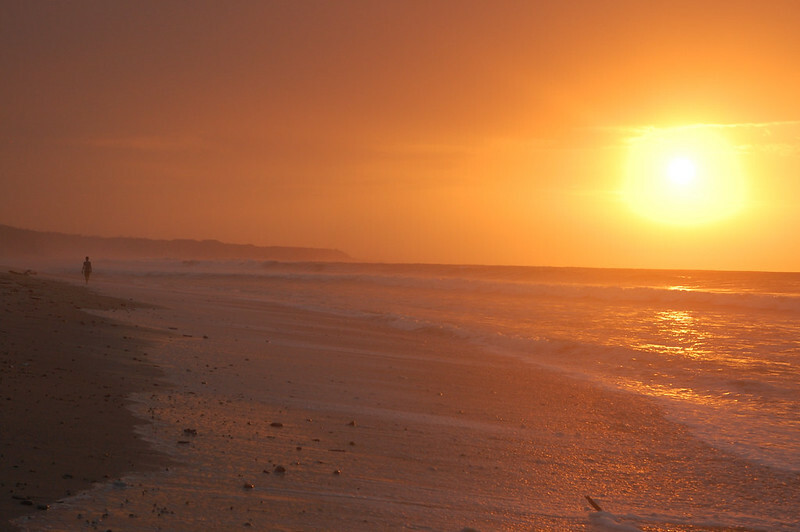 If you’re looking for another amazing beach without having to go this far north, I highly recommend visiting Tortugas near Casma, Peru. 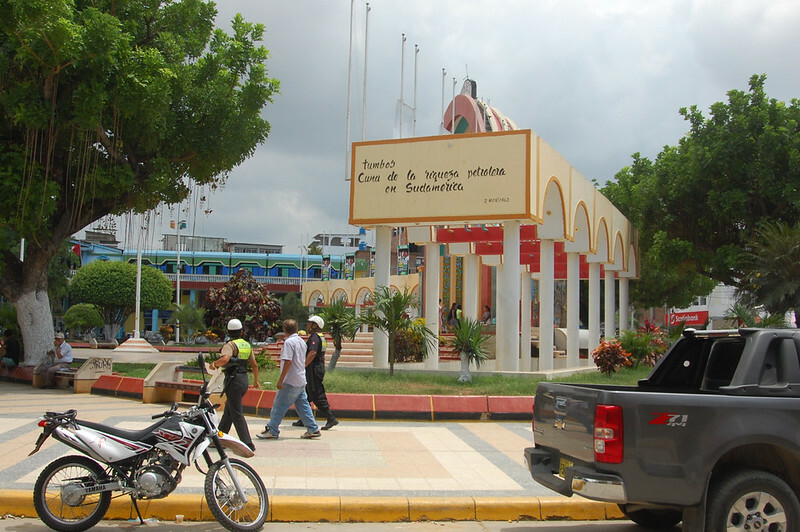 Just FYI: When you enter the department of Tumbes north of Máncora, you will go through a immigration/customs checkpoint. If your van happens to be stopped, you will need to show ID and they will ask for your immigration card. Be sure to have it with you!